A new species in Sequoia National Park reminds scientists of what is yet to be discovered. Deep in the marble caves nestled into the upper foothills of Sequoia National Park squirms a tiny millipede, looking more like a discarded white thread than a living organism. After bushwhacking into a steep valley on a mission to document the park’s cave-dwelling creatures in 2006, scientists encountered the 414-legged millipede. In a study published this October, researchers found Illacme tobini to be a distinct species, only the second of its kind in the northern hemisphere. While a new species of millipede might not seem like the most titillating discovery, it does remind us of the kind of biodiversity still to be found, even in places that have been studied extensively like national parks. The finding also brings up the risk of anonymous extinction— species that disappear before humans even know they exist. Scanning electron micrographs of Illacme tobini sp. n. Ventral view of head and rings 1-3. Anterolateral (right) view of head and first leg pair (scale bar 100 µm). Anterior view of head with gnathochilarium open showing flabellate mandibles (scale bar 30 µm). Lateral (right) view of antenna of I. tobini sp. n. (scale bar 100 µm). Ateral (right) view of gonopods (leg pairs 9 and 10) of I. tobini sp. n.
Dorsolateral (left) view of tenth prozonite and metatergite of I. tobini sp. n. (scale bar 100 µm). Dorsal view of trunk of I. tobini sp. n. (scale bar 200 µm). Dorsal view of left ozopore of I. tobini sp. n. (scale bar 50 µm). Ozopore of I. tobini sp. n. (scale bar 20 µm). Ventral view of rings of I. tobini sp. n. (scale bar 400 µm). Illacme tobini sp. n.: holotype. Scale bar 1 mm. In the Sequoia National Park caves, the porous rocks shelter many kinds of organisms, some of which could be yet unknown to science. “Anything that adds to our understanding of biodiversity is valuable, because we’re facing a situation where we may be losing a lot of those species,” says Bill Shears, professor of biology at Hampden-Sydney College in Virginia, who studied the millipede and found it to be an entirely new species. “Many of them are going to disappear without our ever knowing about them,” as their habitats face increasing threats like development and climate change. In the early 2000s, Sequoia National Park received a grant to start an inventory of its cave organisms. The study was fruitful—around two dozen new taxa were found. A second batch of studies were carried out from 2006 to 2009, when the millipede was found in its dark cave, located in the same watershed as the parks’ famed Crystal Cave. 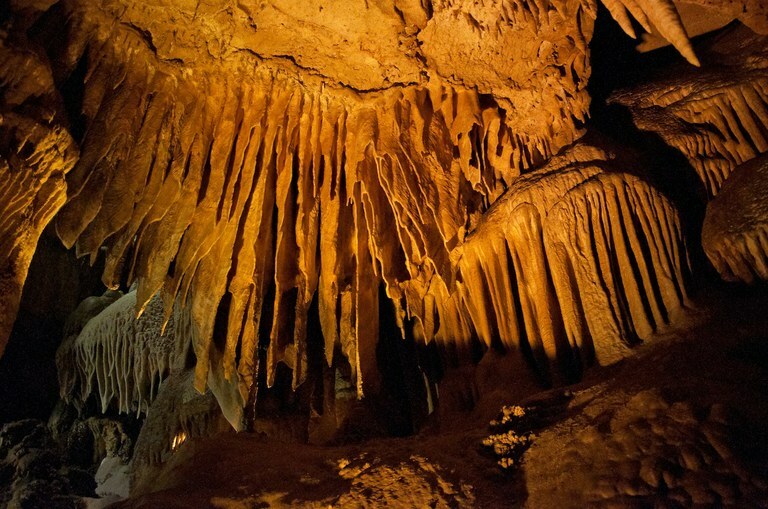 Annie Esperanza, branch chief of physical science for Sequoia and Kings Canyon National Parks, compares the caves to the deep ocean, a fine-tuned environment that not many people get to see. “If we weren’t known for our giant sequoias, I suspect we’d be known for our caves,” Esperanza says. The studies gave the park staff a baseline for future expeditions to see how populations of various species would change with outside environmental pressures like climate change. The new millipede species is part of a family that dates back to Pangaea, when all the continents formed a contiguous landmass that started breaking up around 175 million years ago. The closest fellow species, Illacme plenipes, lives 170 miles away in San Juan Bautista, California, discovered in 2005 by Paul Marek, an associate professor at the University of Vermont. “To me and my colleagues in the little millipede world, it was pretty astounding,” Marek says of the latest Illacme find. After hearing news of Illacme tobini, Marek and a team of researchers searched for more specimens of the millipede inside and near the caves within Sequoia National Park, but came up empty-handed. The tiny millipedes, vital for breaking down organic matter and recycling it back into the soil, are just three-quarters of an inch long, less than a millimeter wide, and extremely hard to find. When Marek was searching for them in San Juan Bautista, his team of researchers had a hard time discerning the little white invertebrates from little white tree roots. On their hands and knees, they’d turn over sandstone rocks and moist oak leaves, and then stare at the ground, waiting to see if the white lines would wriggle. Marek, who calls his subjects of study “charismatic minifauna,” cites the number of organisms that serve humans pharmaceutically as another reason why continued species discovery is increasingly important. “If we lose that species without ever knowing it, we have no way to understand how it might have been helpful to the ecosystem, but also to humanity,” Marek says. “But also in a pure sense: that we have no way to behold the splendor of the organism.” Illacme tobini’s splendor is certainly unique amongst species; despite its minute size, the millipede has 200 poison glands, four penises and silk-secreting hairs. The millipede was found in a cave with a similar environment to Crystal Cave, pictured above.